Stainless steel front, side and 4" front top ledge. Easy cleaning, detachable lift-off 2 piece burner. 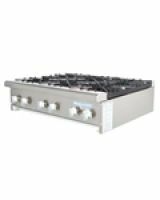 Center concentrate design high performance 32,000 BTU/hr burner. Grooved design top grate ensure direct heat to cooking surface. Ergonomically designed heat resistant PPS On-Off Knob. Adjustable stainless steel standing pilot for each burner. 2" stainless steel legs included.